It is the ongoing debate among gamers. The discussion that continuously comes up and fades away again with no real conclusions being made, most likely because it’s such a subjective topic. It is the argument of what element is more important to a game: storyline or gameplay. Is it the innovation of the controls, the complexity of puzzles, the combat and the creativity of boss designs that make a game? Or is it the plot that drives the players through the game with the twists, turns, revelations and resolutions. For me, The Legend of Zelda has always been more about story than gameplay. Already, many of you disagree, some of you agree, and I haven’t even made my case yet. So is the nature of this heated gameplay versus storyline debate. I can tell you now that amongst those who disagree with me is Nintendo, and Zelda mastermind Shigeru Miyamoto, who clearly values gameplay above storyline. Gameplay has always been a core aspect of the series. In many cases it has revolutionized modern gameplay. The original Legend of Zelda introduced saving, now taken for granted, as well as expansive open worlds. Back in the early days, Zelda was clearly gameplay. The little story they had was in the manuals, and then playing the game itself was the excitement. Things aren’t like that anymore though. Gameplay in Zelda has always been great. The puzzles, the temples, the dungeons have always been great fun, but when I think about it, since A Link to the Past, story has been so much more important than gameplay. Perhaps it is because I’m a thinker and like the theorizing and timeline side to the series. Perhaps it’s because I like pulling out the morals intrinsically weaved throughout the storyline and it has always been what stays with me after the game is over that I see as most important. After all, most games are enjoyable, at least to a degree, while being played. The stand outs are those that remain with you. The best way for me to express why storyline is more important is the simple reason of what drives me to play a Zelda game. Already with Skyward Sword, we’ve all begun to speculate its story, its timeline placement and links to other games. That will be one of the main reasons many of us pick up the game. The actual gameplay itself is something that we’ll try no matter what it’s like. And then when I’m playing, it is the story that drives me through the game. That’s what keeps me coming back. When I’m playing through a dungeon, my thoughts aren’t “I wonder what puzzles await me inside”, but rather they are “I wonder what will happen with the stroryline when I finish this dungeon”. That is what gets me through the trials of the temples. In Ocarina of Time my drive to get through the game was to see what happened when the Door of Time was opened, or once all of the medallions were collected. In The Wind Waker and Twilight Princess I was driven by a desire for answers to questions like “who is Daphnes?”, or “who is Midna?”. It was the story. It was the cutscenes and the cinematics. Gamers often criticize games for cutscenes that are too lengthy, but it is those very cutscenes that make the game for me. That’s why I’ve been slightly disappointed with both Phantom Hourglass and Spirit Tracks with their focus on touch gameplay over story. The story for Phantom Hourglass was, in ways, already over half way through the game. We now just had to get the Pure Metals, defeat Bellum, and it was done. And then in Spirit Tracks, at times I found the actual gameplay to be annoying because it delayed storyline. I wanted to get back to the Tower of Spirits to find out how Anjean was, or to reveal the mysteries of Byrne. I wanted to go get that Demon Train and see the story to completion, not get delayed an hour as I found the Compass of Light and then destroyed trains in the Dark Realm. Story, story, story. It seems so much more prominent to the Zelda series of modern times than gameplay itself. When I think about other games that I play, I realize even more that Zelda is about storyline. Look how devoid of storyline games like Super Mario 64 are. In fact, how many Mario games have started with Peach inviting Mario to her castle for a cake only to have some disaster befall her so that she gets kidnapped by Bowser? Nintendo openly acknowledges there that Mario is about gameplay. Then there’s games like Pokémon, Wii Sports Resort or Monster Hunter Tri, with no story, or just enough story to give some meaning to what you’re doing – be it killing monsters or catching little animals. They’re the games that I play for gameplay. When I play Zelda, I play it to think, not just relax. Nintendo is often targetted for its focus on gameplay over storyline, but let’s really consider what Miyamoto is saying here. In video gaming, the gameplay is the key and unique element, obviously. He focuses on that, and then uses the storyline to keep players engaged and wanting to play. That’s exactly how I feel when playing Zelda. The gameplay is fun, but it is the story that drives me through. It is the mystery that drives me to complete more of the game and find out the truth. The thing is Miyamoto san, I do want a good story, but the story I want is The Legend of Zelda. I would pick up a book or see a movie if there were official Zelda versions, but there aren’t, so the games are where I must go. 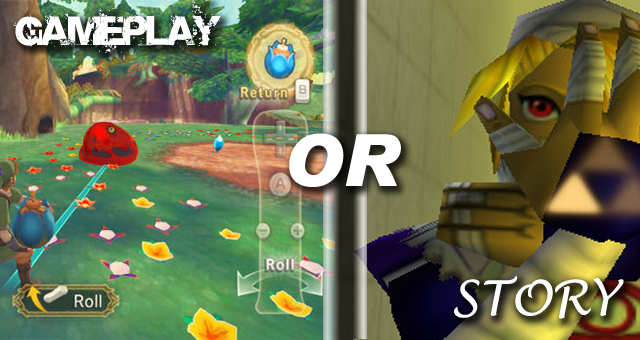 So, what then does this whole debate mean for Skyward Sword – a game where the motion controls and gameplay appears to be the predominant feature? Will the story take a back seat? I doubt it. With what we’ve seen so far, the story looks just as developed as any other Zelda game, and from what we’ve heard, the story was actually developed before the gameplay, unlike in games like Ocarina of Time. I believe Skyward Sword will show that perfect balance of the two. There will be enjoyable gameplay that we progress through with our desire for answers. To me Zelda is story, but the beauty of Zelda is that to you it can be gameplay. To others it can be both. The Legend of Zelda is there for us to enjoy, and that’s exactly what we should do. Let’s accept that different people enjoy different elements and just agree that out of all of the elements that make a game, graphics definitely aren’t the most important.